Manfred Sachse, the “great master” and connoisseur of the art of damask forging, presents the third, further expanded edition of his book. He has added results from his latest research into the blade manufacturing trade in the region of the German town of Solingen. While the long sword-forging tradition of that region is dealt with in various reports throughout the book, he has dedicated the last part of the book particularly to the Solingen region and to the question as to when damask blades started to play a role in the Solingen forges in addition to the common mono-steel blades and how important they were for the local manufacturing trade. The swordsmith and blade trader Peter Knecht and the Weyersberg family, influential forge owners at that time, can be considered as the driving persons behind that development. At least since the 18th century, Damascus steel, which obtains its decorative pattern through etching, had been gaining in importance for parade weapons. 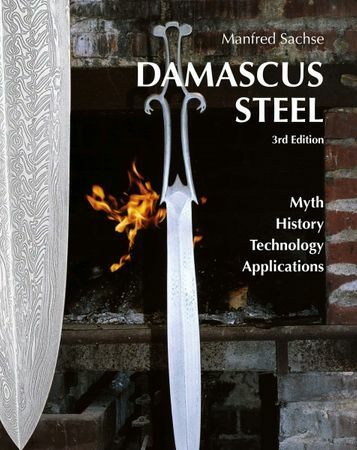 In this beautifully illustrated book Manfred Sachse, an internationally accepted expert in this field, explains in great detail the development of the basic material and the history of European, oriental and East-Asian forged damask steels in the manufacture of blades and fire arms. His authentic description of the manufacturing techniques and myths about Damascus steelmaking in different cultures will impress experts and other interested readers alike.